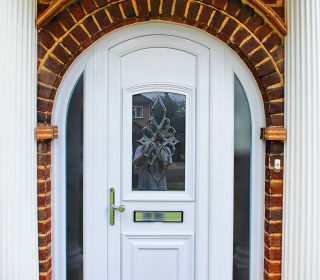 Home News The Difference Between Composite And UPVC Doors? You’ll read a lot about the benefits of composite doors, but how exactly are they different? 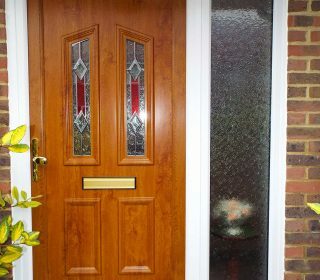 Unlike uPVC doors which are purely plastic, composite doors are made from a number of different materials which are pressed and glued together under high pressure conditions. The materials selected specifically for their properties, and are specifically put together to counteract flaws common in single-material doors. You may ask ‘What Are Composite Doors Made Of?’ They are much thicker than uPVC doors at 44mm compared to uPVC, which are 28mm. A good quality composite door will be made from the highest quality materials meaning they are strong, durable, secure and weather resistant. uPVC doors are extremely secure, but composite doors offer the highest level of security. The super-strong structural frame combined with glass-reinforced plastic, provide infallible protection against intruders. Plus, the laminated glass will not fall out of the door if broken. It will shatter but stay in place. uPVC doors can have some variety (we offer uPVC doors in white, rosewood and golden oak), but with composite doors there are far more options available. You can choose from white, rosewood, oak, green, red, blue and black. You can also decide between a range of beautiful glass options. Composite doors give you the option of being more flexible with design, meaning you can tailor your door to meet the overall look and feel of your home. You can choose a traditional or more contemporary style to suit your exact requirements. Composite doors are great value for money. They are excellent quality, durable and have a life span of around 35 years! They are also extremely low maintenance and easy to look after – simply give it a wipe over and oil the hinges occasionally, and your composite door will continue to look great and work as new. Composite doors are attractive and can enhance the overall look of the property. They come in a number of colours and finishes meaning that you front door can be designed to your personal taste and requirements. Composite doors offer a high level of security and are incredibly difficult to break into due to their super-strong structure and laminated glass finish. Composite doors are easy and inexpensive to look after. They require minimal maintenance – just needing a wipe over and oiled hinges from time to time. Composite doors are weather-resistant and durable, meaning that they last a long time and are not prone to damage. Composite doors offer excellent value for money. Click the link to view more information on What Are The Benefits Of Composite Doors? If you’d like to see what sort of door could work for you just give us a call on 0800 50 50 70 to speak to one of our experts, or get a free quote from our website.